Organizing an event is a gigantic task that often can't be done without the help of staff and volunteers. But, with a limited amount of time, how do you source a fleet of qualified helpers, engage them, equip them to do a good job, and manage them effectively? At first glance, it doesn't seem possible. 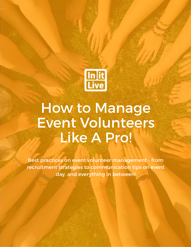 If you're feeling weighed down at all by the staff & volunteer management portion of your event or if you want to improve your thoroughness in this area, this ebook is for you.